The story of a prince trying to return home from a place where no one believes him. I really wasn’t sure what to expect upon stepping up to the Return to PopoloCrois: A Fantasy Story of Seasons Fairytale kiosk. It’s been a long time since I’ve played anything in the Bokujō Monogatari/Story of Seasons franchise (a.k.a. the franchise that used to be called Harvest Moon in the West when it was published by Natsume), with the last game I was heavily invested in being Harvest Moon: Friends of Mineral Town for the Nintendo Game Boy Advance. Within the first few minutes of the demo however, I quickly found that this was certainly not the farming simulation game I was expecting and instead was a JRPG with farming simulation elements. Is this a bad thing, though? Well let’s break down the demo and find out. Return to PopoloCrois: A Story of Seasons Fairytale is a crossover between Story of Seasons and the PopoloCrois series. While many of you are familiar with the farming elements of Story of Seasons, most of you, like me, probably know little to nothing about PopoloCrois. As such here’s the basics. PopoloCrois was a manga that was first published in October of 1984. Over the franchise’s 20 plus year history there’s been two separate anime produced and six games released. The name itself comes from the Italian popolo (meaning people) and the French croix (meaning crossing), thus the full name could be translated as “The crossing of people” which on the surface would lend itself a basic tenet of the Story of Seasons franchise. In particular, how your character’s interaction with the various townspeople influences and changes them. Whether this remains true in this crossover I wasn’t able to ascertain, however the spirit of that seems present. So that’s PopoloCrois, but what about the premise of this particular game? 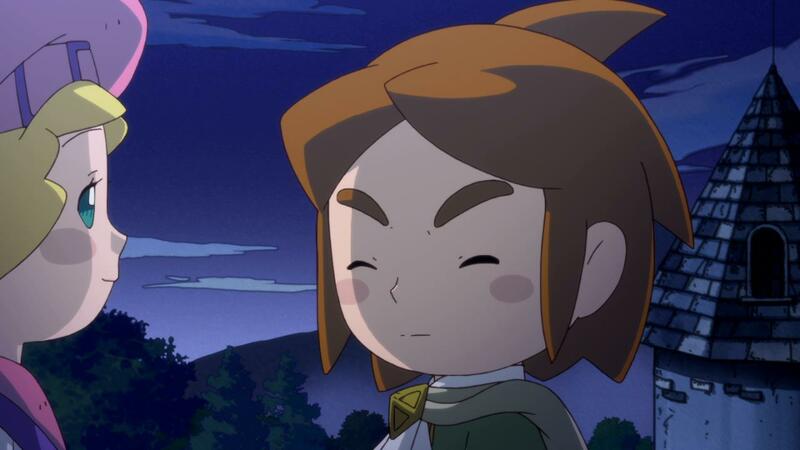 From what I’ve been told, you play the role of Pietro, Prince of the Kingdom of PopoloCrois. The story begins upon the day of his thirteenth birthday where it is discovered that the land has been cursed by a darkness that will not allow crops to grow. The king of the kingdom invites an ambassador from the kingdom of Galariland, who recently had to deal with a similar problem. Pietro volunteers to go to Galariland and learn how to break the curse. Upon arriving, though, no one believes he’s a prince and he finds the land is still afflicted by the darkness. Settling into an abandoned farmhouse to try and figure out what to do, he hears a cry for help from a fairy. Not being one to sit around, Pietro decides to save the fairy and finds himself shrunken down to the size of an ant, which allows him to explore the farmland and find parasites that are causing the darkness. Once defeated, Pietro learns of the Farming Goddess Galariel, who can send him back home. Thus begins your quest to find and defeat the darkness, restore the goddess, and go home so you can save your kingdom. This really is about trying to return to PopoloCrois. This sounds like a JRPG so far though, what about the farming aspect that Story of Seasons is famous for? You know if Pietro had any idea what he was about to get into… yeah he’d probably still go through with this. Well, the farming aspects are entirely optional in this game. That’s not to say they aren’t useful. Farming can get you gold and items that will be useful in your quest. However, it’s not at all required. Really, you need to think of this as a 90’s JRPG with elements from Story of Seasons woven into it. This even extends to what would normally be the bachelorette and marriage system. Pietro already has a canon girlfriend in the witch Narcia. As such, having him date other women might be a bit of an issue. Therefore, this time around, there exist girls who have been blessed by the Goddess. Your goal here is to befriend them so they’ll lend their talents to you and assist in farm work. The end result might be different but the core mechanic and idea still remains the same. As for the other familiar mechanics we all know and love, they’re also present. You can hoe, till, plant, and water seeds, as well as care for animals and all their growth is done in real-time, as you play, rather than the familiar day/night cycle you may be familiar with. This allows you to tend to your farm then go exploring or dungeon crawling while you wait for your newest crop of Rock Hard Daikon Radishes to be ready. The game will even alert you when a crop or animal needs attention and you can fast travel to your farm by pressing the Y button and selecting your farm from the map — so long as you’re not shrunken down, that is. No worries though if you want to finish exploring that dungeon, as your crops won’t wither if they don’t get water. Though I was unable to test if not feeding the animals as soon as they’re hungry has any negative effects. You also have at your disposal an item synthesis system that allows you to combine two items together to create another one, and with over 600 items in the game this can be a time sinker. There’s also souvenirs to collect, bug hunting, upgrading your farming equipment, and a whole host of other side quests that will at least double the amount of time you can spend playing the game. The main quest alone clocks in at about 20 to 25 hours, so that’s still a lot of content on its own. With the basic premise out of the way, let’s talk controls. The controls here are nothing crazy and pretty basic. R and L are used to switch between your farming tools. No longer do you have to go into your bag and equip/unequip them. Instead you can just switch between them on the fly using the shoulder buttons (ED.NOTE: If I think I understand what Benny is talking about, this was done in Rune Factory 4, but not really done in the main series yet). The Y button opens a map which you can then use to fast travel to different locations, including your farm. The X button opens your menu, while the B and A buttons keep their general functions of cancel and confirm/talk respectively. Movement of course is done with the circle pad, but the D-Pad can be used as well. As you can see, pretty simple stuff, so let’s dive into the playthrough itself and see how things went. 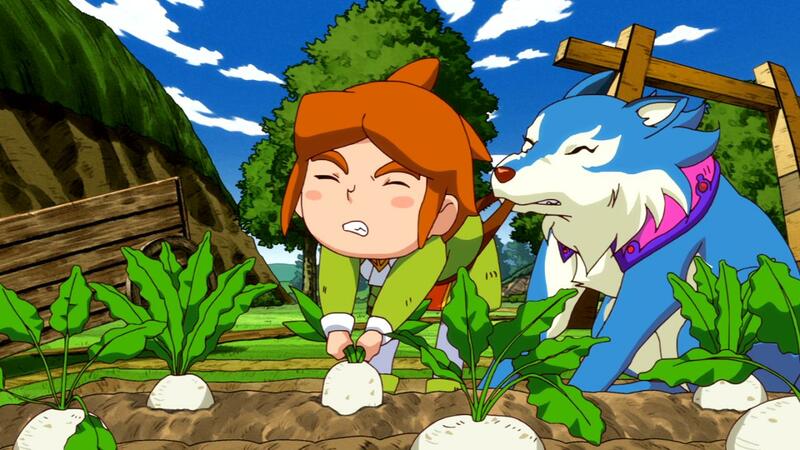 Pietro: Prince, Hero, Farmer, and completely devoted to Narcia. Not even girls blessed by a goddess can tempt him. My playthrough of the game had me start out at the farm with the party at about level 17. This made the battles, including the one boss I faced, rather easy. However, it did give me a chance to play around with the combat system and get a feel for things. We’re getting ahead of ourselves, though; first the farming. First thing was to check out my field, which already had some crops growing in it. One thing I would like to note is that normally the camera is in an isometric viewpoint as you wander the world, but upon stepping onto your field it will shift 45 degrees to make things easier for you as you tend to your crops. With the crops good, I walked over to a lady who was standing in front of my barn. It’s from this woman you can purchase your animals, though at this point all I could buy was a chicken — or as the game calls them, a cuckotti. Later in the game though, you’ll also be able to buy sumoo (cows) and pacapacas (alpacas). One purchase later, Coco-chan was delivered into my barn, and I went inside to feed her. Feeding works a little differently this time as you can choose how much feed to place in the box. Obviously, more feed will allow you to go on longer trips without having to worry about running back to tend to your animals. With that in mind, I used a few Rock Hard Daikon to fill the bin and continued exploring the farm, with the next stop being the Item Synthesis shop. Synthesis is really simple in this game: select two items and the game will tell you if it’s possible, then just see what happens. In my case, I chose a turnip and bitter spinach which gave me some green soup and cleared one of the tutorial quests. The item synthesis shop is also where the souvenirs you collect are stored, one of them being a frozen turnip. With synthesis done, I decided to go out and explore the world, only to be told after a few fights that my Daikons were ready to be harvested. I ran back to pick them and found that once I did they were automatically put away in my bag, which is a nice touch. After planting some Tear Inducing Onions (because who doesn’t like a good cry), I decided to get to testing out the combat by warping to a village in the northeast, which was the next objective in the main quest. Pull Blue Wolf! We have to feed those cuckottis somehow! The current goal of the main quest was pretty simple. There were five fields in the area that were afflicted by the darkness. Go find them and defeat the monsters invading them. With my marching orders, I set out and started to toy around with the combat systems a bit more. Upon entering a battle, you’ll have four options: Move/Attack, Skill, Item, and Run. Move/Attack is just as it sounds, it allows you to move your character on the field and then attack if you’re in range. Movement is done via a tactical grid, so if you’re familiar with Fire Emblem or Super Robot Wars you’ll see the familiar blue squares that show your movement and red squares that show your attack range. Move up until you’re within range and then attack; pretty simple, though keep in mind back attacks do inflict more damage. Next, your Skills menu gives you access to your special attacks. Some will allow to move before using them but others will require you to stay stationary to use. One neat thing is that characters can team up for different attacks, like the dual techs from Chrono Trigger. However, one important thing to keep in mind is each character has a different tech listing. So say Pietro has a combination with Nino (another party member), you can only access that skill using Pietro, though Nino may have his own special combination with Pietro in his skill menu. The tradeoff is that it only pulls from one character’s MP instead of two so it actually kind of works. Your items menu is of course used to access your items and the run command allows you to escape. Do keep in mind though that running causes you to drop some money, so be careful. While we’re on the topic of battles though let’s talk about the encounter rate. One of the things I was told is that XSEED Games is looking into seeing if some way to manipulate the encounter rate can be implemented like a slider. While there’s no guarantee this will occur, the encounter rate didn’t seem unfair to me. However, I can imagine it’d be a useful feature if you’re having to backtrack through a previously explored area. After a little bit of searching, I made it to one of the patches of farmland that was afflicted and shrunk down ready to explore the dungeon. The dungeon itself was pretty simple. It was a series of interconnecting vines that eventually led up to a mini-boss that was a lizard like creature with a gem on its forehead called Sabel. However, thanks to my high level party, he proved little challenge as I surrounded him and proceeded to merely test out a few skills on it before it died. With the boss defeated, I decided that was a good stopping point for this demo (having spent half an hour with the game) and ended my playthrough there. So now that I played it, how did it perform? Were there any issues? 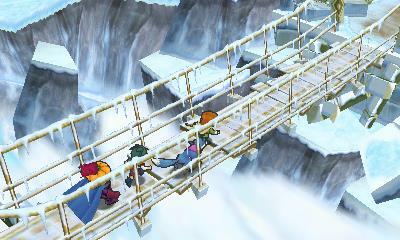 First one to slip and fall off the bridge buys lunch! I really didn’t detect any technical issues with the game. 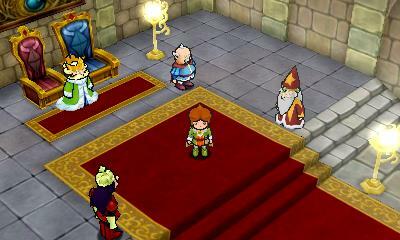 The graphics are pretty standard for a 3DS JRPG. However I will note that the 3D on this one looked gorgeous and I really found myself impressed and immersed by it. The controls themselves felt fine and I didn’t have any issues. Frame rate wise, I didn’t notice any issues, but was told there may be a small dip when the game loads voice clips, though even with the attack calls I didn’t really notice this. So, all in all, what do I think of Return to PopoloCrois: A Story of Seasons Fairytale? It’s very hard to judge a JRPG solely on mechanics, because the story is such a major part of the experience and I didn’t really get to experience much of that here. That being said, I think you need to come at this one not with the mindset of a Story of Seasons game, but instead treating it very much as a JRPG with farming elements. Those elements seem to work just fine and they seem to integrate into the formula very well. However, if the only thing you wanted was another farming simulation game you may be a bit disappointed. If you are looking for a JRPG with a unique hook then this may be right up your alley. We’ll keep an eye on this one when it launches later this year in Winter. In the meantime, check out our review of Story of Seasons and Rune Factory 4 to get an idea of what we think of the Story of Seasons side of this crossover.